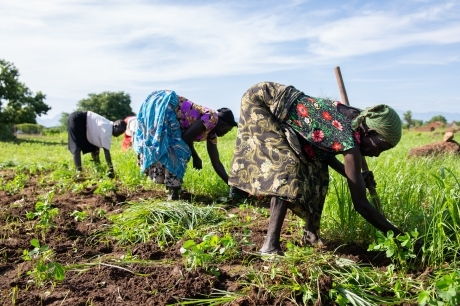 Investing in people’s livelihoods in South Sudan is paving the way to Zero Hunger. 13 August 2018 (FAO)* — Conflict, economic turmoil, climate extremes and poor infrastructure are some of the challenges to food security in South Sudan. Akuilina Ihurre used to think she was too old to join a farmers’ group but she knew she needed support to overcome years of hunger. Today, she is producing food with seeds, agricultural tools and techniques acquired through an FAO Farmer Field School in Torit, in South Sudan. Akuilina is one of nearly 1 800 people who are learning farming skills at more than 60 new FAO agropastoral Farmer Field Schools in the state of Eastern Equatoria. Her group of 30 farmers includes 20 women, many of whom are single mothers with sole responsibility for their children. Farmer Field Schools (FFS) are centered on the concept of hands-on learning with the goal of building on farmers’ skills and enhancing their capacity to critically analyse and solve their agricultural challenges. In FFS, farmers are the experts and decide what is relevant to them and what they want the FFS to address in their curriculum. This ensures that the information is relevant and tailored to the participants’ actual needs. 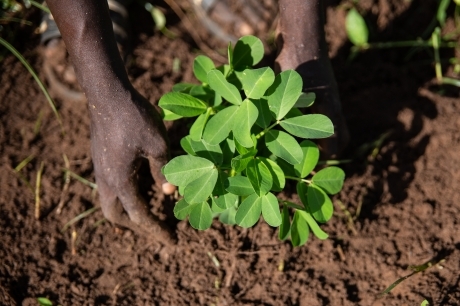 “Together we have planted a whole field of vegetables and crops that help to feed our families,” Akuilina says. This is a turning point for the mother of seven children and grandmother of five, who in recent years was widowed,attacked and robbed in her own home. “Hunger and hardship have followed me all of my life,” Akuilina says. South Sudan has experienced ongoing conflict, an economic downturn and deepening food insecurity, but Akuilina is doing her part to realize her community’s potential. She lives in a fertile, picturesque area of the country, nestled between green hills and a rocky mountain range. Since joining the agropastoral training programme, Akuilina has learned to line up and space crops, take care of growing plants by weeding, and use tools to loosen the soil. Once group members graduate from the programme, they often join the next phase, supporting each other through a savings-and-loan club to make their community more resilient. FAO in South Sudan aims to reach at least 800 000 food-insecure households through emergency livelihood support and activate resilience-building activities where possible. These include agropastoral field schools, like the one where Akuilina has received training. As the farming group’s elder, Akuilina has become a counselor, the person other women turn to whenever disputes arise.